Everyone blows it from time to time, and if you’re like most people, you hate it when you screw up. It’s one thing to make a trivial blunder like misbalancing your checkbook or forgetting something at the grocery store, but when you really mess up…ouch! Knowing what to do after you really mess up is what Episode 021 of The Live It Forward Show is all about. Kent Julian shares a personal story of how he made a major leadership mistake, what he could have done differently to avoid the mistake, and 5 steps each of us can take after making a major misstep. You are guaranteed to either learn something new in this episode or at least be reminded of something important that will help you succeed in your life and work. Spoke in North Carolina last week. Moved one of our twin daughters to college last week. Moving our other twin daughter to college this week. 3. What To Do After You Really Mess Up. Highlights from a major leadership mistake made by Kent. What Kent could have done differently to avoid this leadership mistake. 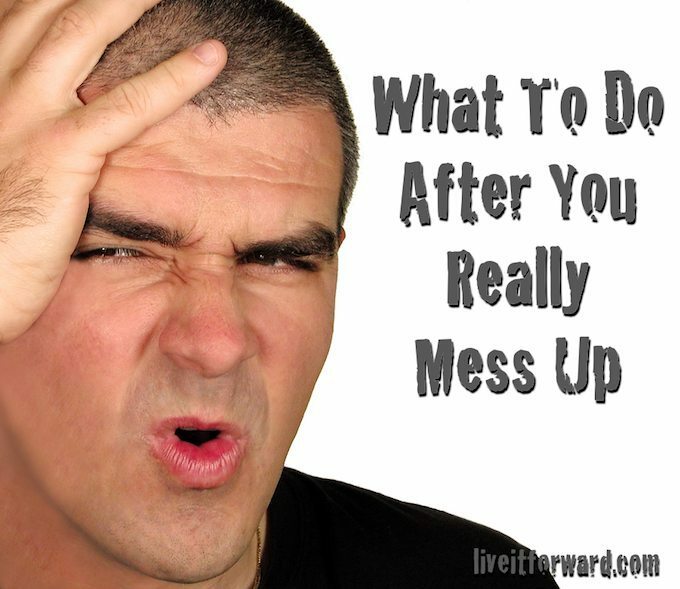 5 steps to take after you really mess up. Step 1: Run at the problem. Step 2: Take ownership by asking forgiveness. Step 4: Don’t get stuck. Step 5: Learn and grow. 4. The Live It Forward ADVANCE Conference registration opens up this week!